How to edit forum's CSS colors? I have this forum : transactionbourse dot com/vanilla (I can’t post links for the moment). I just want to change the blue colors (the blue button on the left and the blue DIV on the top). Do you mean the header and the Connexion button? Thanks to you, I’d be able to change the header, wonderful! 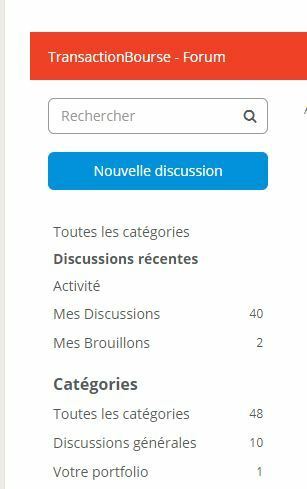 But it’s not the connexion button but the “new discussion” button, I think you get it only if you are registered in the forum, here is a screenshot (the blue button). Makes it a little hard to help. It might be the .NewConversation class. Did you try inspecting the button? I inspected, it was “a.Button.Primary.Action.NewDiscussion.BigButton”, and I edited the color.